Honestly I don’t know where to start. As some of you may know, I’ve been feeling down and not myself prior to the New Year’s of 2019, that was why I know this trip back to Vietnam (first trip in 4 years away from home) was urgently needed, both for reconnections with friends and family, as well as with the young happy-go-lucky girl that I used to be. All I can say is that I got what I wanted from the trip. I was spoilt with love and laughter and good food with good drinks and sunny days. I feel completely different coming home this time, calmer and lighter at heart. It felt .. exciting and somewhat nervous to be back to my hometown at first. The lights and the buzz of the city filled my senses. There was always something going on, something to see, something to listen, something to smell, something to enjoy, something to raise eyebrows at, something to be alert, something to avoid and something to look forward to. I’ve relearned the skill of filtering out noises and being aware of my surroundings all the time. Living in Hanoi, I feel like your survival mode must be switched on at all times. A lovely corner close by the cathedral. I walked by this street countless times during my childhood but never realized its beauty until now. And the streets look different now, I was barely able to navigate myself around the city without google maps. New brands and chains and shops showed up, giving the city a complete new look. Yet I soon found out, under that new make up, my hometown was still the same old city that I know so well. My heart sang secretly whenever I found a familiar corner or an old restaurant that still hasn’t changed over the years. 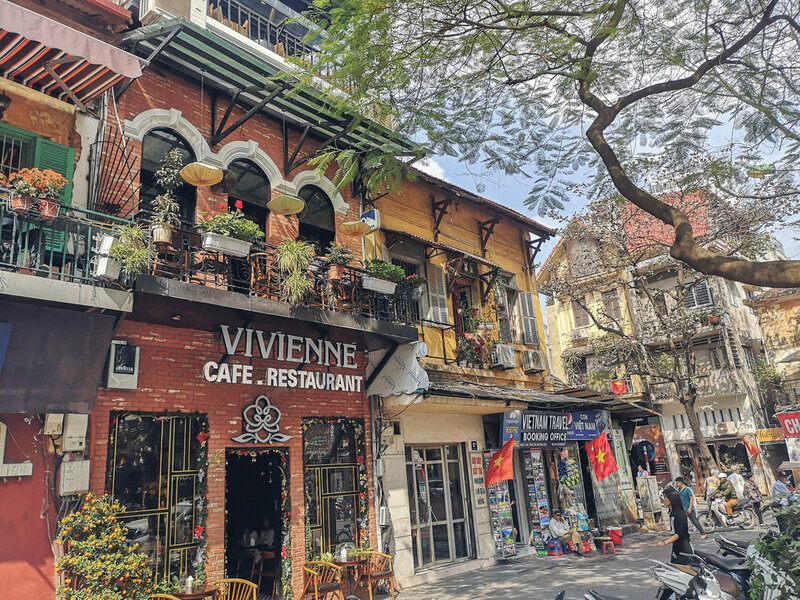 My favorite Cong cafe was still dreamy and romantic as always, Dinh Le street was still packed with my most favorite thing in the world (other than food): books, and my good old Ta Hien street was still vivacious like a drunk teenage girl. My street was still quite the same with the same old St. Joseph’s cathedral, same old neighbors even though some had unfortunately passed away, and same old chaos everyday after school (you can’t imagine how many schools we have in just 2 small streets). Chaotic as it could be, I always find Hanoi a poetic city, a hub for those dreamy artists who courageously live their artistic life despite of the daily hustles. So many questions and feelings popped in my head. Did I change too much? Did they change too much? How do we reconnect after so many years? I miss our old days but I know that to an extend it would never be the same. High school was the best time of my life. I’ve made friends for life there and I love each and every one of them. But people grew up and people grew apart, this is nothing new. Despite my worries, I had one of the best months of my life there. Reunions after reunions, I wouldn’t say that thing hasn’t changed a lot, but the love and the friendship were definitely still there. I got to spend wonderful days traveling and making new memories with my friends, instead of just recalling high school memories together. Not sure if those houses are habitable but to me they are charming as hell. Hanoi is far from a perfect city, but I believe that the people make the place and it’s the people there who show me so much love that make Hanoi so special for me. Not only my heart was full, my tummy was full pretty much all the time as well. I feel bad to end the post without some food recommendations, so here goes. One of my most favorite place to hang out with friends for cheap beer and snacks is Ta Hien beer street. This place might have been too popular among Hanoian youth and backpackers already but it still deserves a shout-out since I love the energy here so much. The whole street is packed with live music bars and pubs, and the most dominant of all: local street beer and snack bars. Vibrant, crowded, musical, perhaps a bit chaotic with all the chatting, laughing, cheering, shouting, singing and people trying to pass through. Come here with a light heart and an open mind and enjoy the local street foods with cheap beer and some good company, that’s what this street is all about. Ta Hien street on a Tuesday night. Who waits till Friday duh? - Phở Tu Lun, 23 Hai Ba Trung street, known for its meaty savory broth. Prices are at the high compared to the norms: 60,000 VND (2 euros) for a bowl of phở. - Phở Hang Gai, my mom’s favorite place for a phở breakfast and this place now has my approval too. Just a small street vendor, I don’t quite recall the exact address but it was close to the Hang Gai - Luong Van Can cross. 25,000 - 30,000 VND/ portion. - Phở Hang Gai, also my mom’s favorite and same location but it’s actually run by a different owner, only open in late afternoon - evening. Same price range and tasty as hell too. - If you crave Phở Gà ( phở with chicken ) go to Hang Hom street. This street nowadays is filled with phở gà vendors, serving different tasty variations of chicken and noodles. My favorite address to go to is 33 Hang Hom, but do try at other addresses and let me know! - Phở Xào Phu My, 45B Bat Dan street, was my favorite place for stir-fried noodles. The stir-fried beef noodle here is seriously delicious in huge portion. The beef is so tender and noodles are perfectly wok-ed, everything is seasoned to perfection, and the distinct smokiness from the wok gives every bite a perfect end note. I couldn’t finish one portion on my own and my bf couldn’t help me finishing it either cuz he also struggled to finish his too. Maybe because we were being pig snacking on every kind of street food before going there for dinner. Remember my wise words guys: come here on an empty stomach!! The mighty stir-fried noodle is here. Some tasty grill pork skewers on the street. Another Hanoian favorite breakfast and late night snack is Cháo sườn - pork rib porridge served with small pieces of bread stick and pork floss. This dish is also part of my childhood memory and my favorite until now. The airy crispy bread sticks covered by savory silky smooth porridge create such a happy bite. Again this is a dish that you can find in almost any street alley in the early morning. 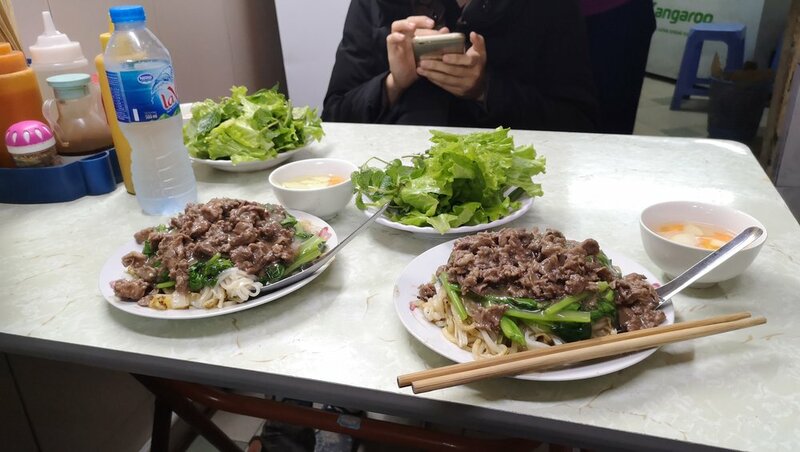 However for a late afternoon or evening snack, my absolute favorite place to go is Cháo sườn sụn Huyen Anh at 14 Dong Xuan street, near Dong Xuan market. One special thing they serve with the porridge here is rib cartilage, cooked to tenderness. If you’re not into the cartilage like my bf, just order a cháo quẩy ruôc ( porridge with breadstick and pork floss), they will leave the cartilage out for you. Pork ribs porridge, not from the place I recommend but from an old place where I usually go for breakfast only. Bún chả (noodles with grilled pork - the dish that got so popular after Obama’s visit), bún đậu mắm tôm (noodles with fried tofu and fermented shrimp paste), bún riêu (noodles with crab broth) and bún ốc (noodles with snails) are also Hanoi’s must-eat! Such a pity that I didn’t go out for any bún chả during my visit cuz I have a mom who makes killer bún chả for me already. Although right now I’m regretting not having more of it because I’m literally dying for some bún chả at the moment. Popular bún chả places according to my friends are those at Hang Manh, Hang Quat and Hang Than streets. Sorry for not having the exact addresses, I’m useless. However I can recommend a bún đậu mắm tôm place. 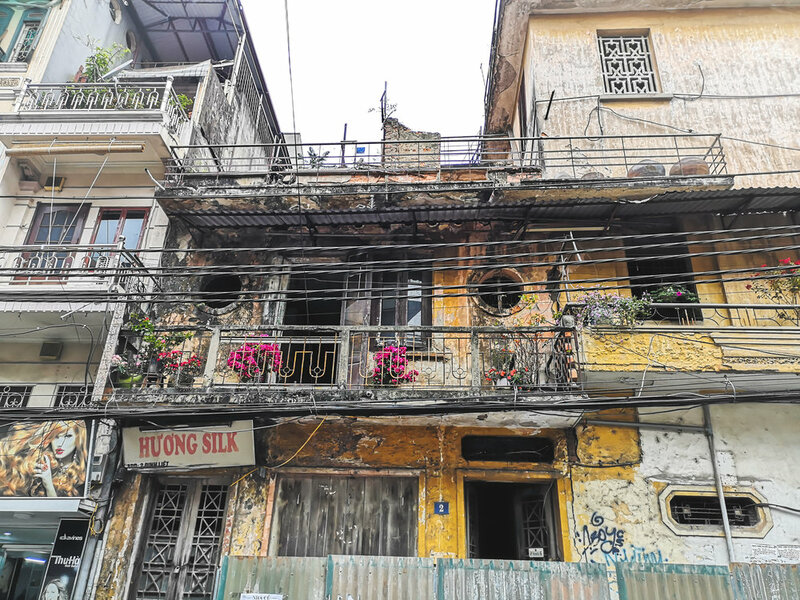 A small alley at 29 Hang Khay street is the place to go to, although in my opinion, it was way better 5 or 6 years ago when this place was only popular to street locals. But I still find myself coming back here every time I come back home in Hanoi. Do you see ‘em snails? Is it getting freakier yet? Still tasty as hell tho. Wanna try some eel dishes? Come to number 1 Chan Cam street for miến lươn (eel noodles). This eel noodle shop has been around for more than 10 years and it has been, again, my mom’s favorite place. Here you could try eel starter soup, stir-fried glass noodle with eel and glass noodle soup with eel. I think they have more dishes on the menu but those I listed are the ones that we keep coming back for every time. If you want to be even more adventurous, try trứng vịt lộn - baby duck egg (also called balut in Indonesia) and snake! You can have baby duck egg in every corner of Hanoi, for breakfast or afternoon snack, literally you would find those tasty yet scary looking eggs in every street. Did I tell you that baby duck egg was one of my usual breakfasts when I was in primary school? Don’t let the look scare you away. Even little girls can eat them duh. For snake however, you would have to find a specific type of restaurant that specializes in serving snakes, book a table in advance and choose the main course for your meal. Yup, you get to choose the snake that you’ll be eating. Not like looking the snake in the eye and say “this one looks fat, let’s get this one”, but more like letting the staff know what type of snakes you’re having in mind, how big of a snake you’d prefer and what type of dishes you want them to prepare from that snake. Usually people book a table for more than 6 for this occasion since the price is on the high end. It was hands down the most expensive meal we’ve had in Vietnam. Snake obviously won’t be something that I would eat on a daily basis because of the price tag and of the pretty graphic handling of the snake. However to my taste bud, they tasted pretty damn good. So many people asked me if snake tasted like chicken, come on, why do you people always find the most boring comparison? It was more like a firm fish I would say. Even the skin was quite nice, gelatinous and a bit on the chewy side. The place we went to have this experience was Xuan Chu Vuon at 58 Viet Hung street, Long Bien, Ha Noi. Okay the food recommendations turn out to be longer than I planned, but this is barely scratching the surface guys. There are so many dishes that I could write a whole book just about Hanoi’s street food. The only thing I can say is, go to Hanoi and try all of them out yourself! Just me enjoying the sun in the roof top of my favorite coffee place on my favorite street. How I love those chairs and tables.